The Western Union Foundation has committed a grant of $250,000 to the Denver Public Schools (DPS) Foundation in support of innovative programs in DPS, with a strategic focus on narrowing Colorado’s skills gap. The grant is being made as The Western Union Company makes a significant and long-term commitment to Denver, as the location of its global headquarters. Among the first programs to receive Western Union Foundation support will be the DPS CareerLaunch internship program. The CareerLaunch program is designed to give students the opportunity to apply classroom learning and build critical real-world skills through six-week and semester-long internships. According to the DPS Foundation, 67.3% of DPS students live in poverty. CareerLaunch internships give students the opportunity to earn a financial award as well as begin to build professional networks they might not have otherwise. As part of its support, the Western Union Foundation will also be the Presenting Sponsor of the DPS Foundation’s 2018 Achieve Gala, the organization’s largest annual fundraising event that showcases the talents and achievements of DPS students and is attended by nearly 1,000 guests. Funds raised at the Gala help DPS ensure that every child in Denver has access to a quality education. “We could not be more excited about the Western Union Foundation’s commitment to the CareerLaunch program, which literally helps launch students into success and changes the trajectory of their lives. And I believe that our city is strengthened by every student who graduates ready to lead a successful life,” said DPS Foundation President and CEO Verónica Figoli. The Western Union Foundation has supported the work of the DPS Foundation since 2003. This new investment reflects the Western Union Foundation mission to support educational initiatives in its hometown and throughout the world. In addition to the Western Union Foundation previous financial support to the DPS Foundation, Western Union employees have volunteered to read with elementary students in classrooms, donated school supplies, and participated in mentoring programs for students. 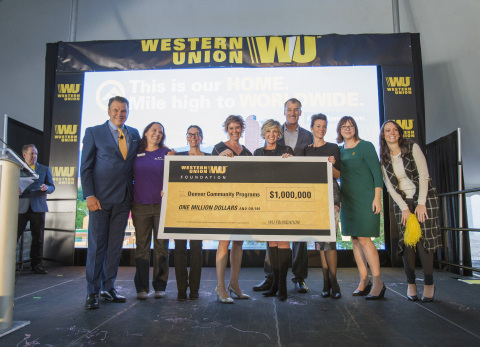 Last year, the Western Union Foundation announced a $1 million funding pledge for local community programs throughout Denver. In addition to the Denver Public Schools Foundation, the money will be distributed to other local non-profits and NGOs such as Junior Achievement Rocky Mountain, Emily Griffith Technical College, and Mi Casa Resource Center. Since its inception in 2001, the Western Union Foundation has provided more than $8 million in grants to 340 non-profits in Denver. The Denver Public Schools Foundation is Denver Public Schools’ fundraising partner, generating resources, building relationships and championing public education to impact system-wide achievement in order to realize the vision of Every Child Succeeds. The DPS Foundation engages the entire community in support of DPS’ more than 92,000 students and more than 200 schools. Learn more at www.dpsfoundation.org. The Western Union Foundation believes that education is one of the surest pathways to economic opportunity. Through collaborations with NGOs around the world, the Foundation has embarked on a five-year mission to connect 50,000 migrants, refugees, women and young people to the global economy through demand-driven skills training and workforce enablement programs by 2020. The Foundation also offers a global scholarship program that helps put a post-secondary education in reach for in-need students studying in the STEM fields and business. To date, more than $113 million has been given to fund projects affecting more than 800,000 people in 137 countries across the globe, including humanitarian relief for communities in crisis. The Western Union Foundation is a separate charitable corporation that is tax-exempt under §501(c)(3) of the US Internal Revenue Code, and receives support from The Western Union Company, its employees, agents and business partners. Contributions to the Foundation are tax-deductible for US income tax purposes. To learn more, visit the Western Union Foundation webpage or follow us on Twitter @TheWUFoundation. 04/12 WESTERN UNION : Two Romanian Cybercriminals Convicted of All 21 Counts Relating ..
03/21 WESTERN UNION : Teams Up with Thunes to Expand Payout Capabilities to Mobile Wal..
03/18 WESTERN UNION : Teams Up with Thunes to Expand Payout Capabilities to Mobile Wal..